X Its arms are hard as rock. With one swing, it can break a boulder into pieces. X Schon ein Hieb seiner steinharten Arme schlägt selbst den stärksten Felsen zu Bruch. X Un seul coup de ses puissants bras suffit pour pulvériser même les plus gros rochers. X Con sus brazos duros como el acero puede partir rocas gigantescas en mil pedazos de un solo golpe. X Ha braccia dure come roccia, capaci di frantumare in mille pezzi un masso con un colpo solo. X 돌처럼 딱딱한 팔을 한 번 휘두르는 것만으로 거대한 돌을 조각조각으로 부순다. Y It can swim while towing a large ship. It bashes down foes with a swing of its thick arms. Y Es kann im Schwimmen ein großes Schiff ziehen. Seine Gegner schlägt es mit Schlägen seiner Arme zurück. Y Il peut traîner un grand bateau en nageant. Il assomme l’ennemi d’un grand coup de ses bras épais. Y Puede nadar y arrastrar un barco grande. Golpea a sus enemigos con sus gruesos brazos. Y Nuotando riesce a trainare una grande nave. Con le braccia vigorose abbatte i nemici in un sol colpo. Y 큰 배를 끌며 헤엄치는 파워의 소유자이다. 굵은 팔을 한 번 휘둘러 상대를 때려눕힌다. 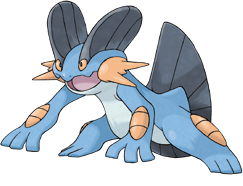 Omega Ruby Swampert predicts storms by sensing subtle differences in the sounds of waves and tidal winds with its fins. If a storm is approaching, it piles up boulders to protect itself. Omega Ruby Sumpex kann Stürme voraussagen, indem es feine Veränderungen der Geräusche von Wellen und Wind mit seinen Flossen wahrnimmt. Wenn eine Sturmfront aufzieht, häuft es Felsbrocken an, um sich zu schützen. Omega Ruby Laggron peut prédire l’arrivée des tempêtes en utilisant ses nageoires pour sentir les variations dans les vagues et les marées. Si une tempête s’approche, il empile des rochers pour protéger son habitat. Omega Ruby Swampert puede predecir tormentas al percibir con las aletas los sutiles cambios que producen las olas y las corrientes. Si está a punto de estallar una tormenta, empezará a apilar piedras para resguardarse. 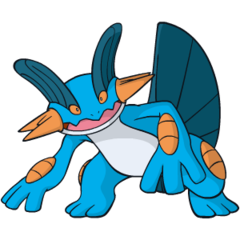 Omega Ruby Swampert prevede le tempeste poiché grazie alle pinne percepisce le sottili differenze nel suono delle onde e dei venti dovuti alle maree. In caso di burrasca imminente, crea delle pile di massi per proteggere la tana. Omega Ruby 대짱이는 파도 소리나 바닷바람의 아주 작은 차이를 지느러미로 감지하여 태풍을 예감한다. 태풍이 불면 바위를 쌓아서 둥지를 지킨다. Alpha Sapphire Swampert is very strong. It has enough power to easily drag a boulder weighing more than a ton. This Pokémon also has powerful vision that lets it see even in murky water. Alpha Sapphire Sumpex ist sehr stark. Es kann mit Leichtigkeit einen Felsblock bewegen, der über eine Tonne wiegt. Weiterhin ist es mit einem exzellenten Sehvermögen ausgestattet, wodurch es auch in trüben Gewässern sehen kann. Alpha Sapphire Laggron est très fort. Tellement fort qu’il peut aisément tirer un rocher pesant plus d’une tonne. Ce Pokémon est également doté d’une vue si efficace qu’il peut même voir à travers l’eau trouble. Alpha Sapphire Swampert es muy fuerte. Puede arrastrar una roca que pese más de una tonelada sin ningún problema. Este Pokémon tiene el sentido de la vista muy desarrollado. Es capaz de ver hasta en aguas cenagosas. Alpha Sapphire Swampert è molto forte. Ha una forza tale da riuscire a trascinare un masso del peso di 1 tonnellata senza fatica. La sua vista è così acuta da riuscire a penetrare anche l’acqua più torbida. Alpha Sapphire 무게 1톤 이상인 바위 덩어리를 가볍게 잡아당기는 파워를 지닌 포켓몬이다. 탁해진 물속도 들여다볼 수 있는 시력을 지녔다. Ruby Swampert is very strong. It has enough power to drag a boulder weighing more than a ton. This Pokemon also has powerful vision that lets it see even in murky water. Sapphire SWAMPERT predicts storms by sensing subtle differences in the sounds of waves and tidal winds with its fins. If a storm is approaching, it piles up boulders to protect itself. LeafGreen Its arms are rock-hard. With one swing, they can batter down its foe. It makes its nest on beautiful beaches. Diamond It can swim while towing a large ship. It bashes down foes with a swing of its thick arms. Pearl It can swim while towing a large ship. It bashes down foes with a swing of its thick arms. Platinum It can swim while towing a large ship. It bashes down foes with a swing of its thick arms. SoulSilver Its arms are hard as rock. With one swing, it can break a boulder into pieces. Black It can swim while towing a large ship. It bashes down foes with a swing of its thick arms. White It can swim while towing a large ship. It bashes down foes with a swing of its thick arms. White 2 It can swim while towing a large ship. It bashes down foes with a swing of its thick arms.